The heavy duty Mack Telfer works his way through ECSU players on his way toward UMF's try line. 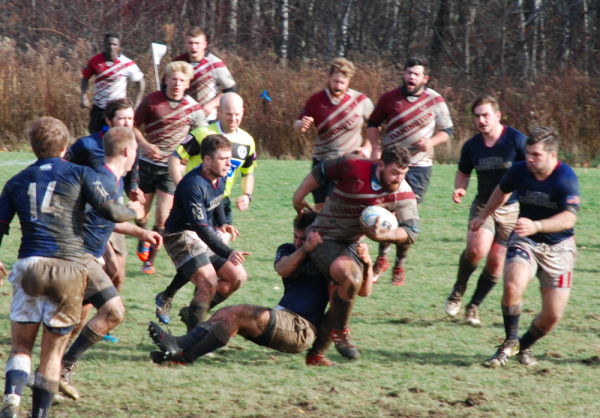 WATERVILLE - The University of Maine at Farmington men's rugby team entered the New England Rugby Union Championship hopeful to continue its perfect season in the first round of playoffs held Nov. 3 and 4 at Colby College. After beating long-time rival Colby College on Oct. 27, UMF, ranked No. 2, faced the No. 12 ranked Holy Cross Crusaders in the fist round of the NERFU Championship. The other semi-final match for the NERFU Championship saw No. 11 ranked Colby College taking the pitch against No. 15 Eastern Connecticut State University. The winners of these two matches would meet on Sunday in the NERFU Championship Final, and both will advance to the NSCRO Northeast qualifier. On a raw and rainy Saturday afternoon, the UMF men were determined to start strong against the highly skilled Crusaders. The two teams have become very familiar with each other having playing three times in the last year. 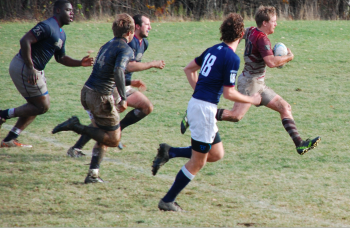 Once the muddy match began, the Beavers' relentless backline saw standout flyhalf Killian Miller feed outside center Draco Peaslee for the first try of the match. The strength of Holy Cross was their skilled backline, but the slick playing surface and greasy ball caused them greater difficulty. The UMF backline defenders, led by the always dependable Shane O'Neil and newcomer Davion Jackson rose to the occasion and kept Holy Cross scoreless in the first half. 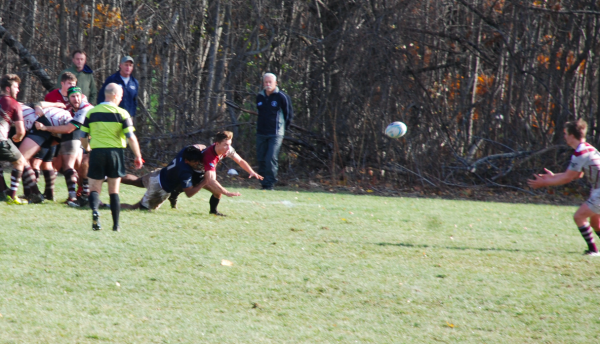 UMF standout Killian Miller breaks through the line to score the second try of the NERFU championship match on Sunday against ECSU. As all mud bowls tend to develop, it was ultimately the work of the forwards, and in particular the UMF back row that would leave their mark on the match. 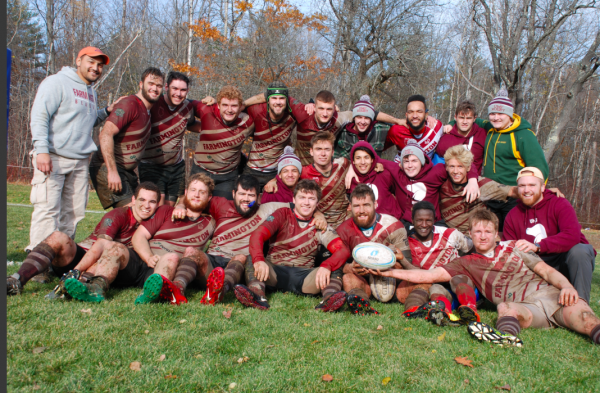 Senior Quinn Fogarty, and his wing-forward counterparts Thomas Young and Brady Denison each netted a try apiece and punching UMF's ticket to Sunday's final. At the final whistle, the Crusaders season ended on a scoreline of 17 points to UMF's 38. Despite the rain and wind and cool temperatures, first match winners ECSU bested Colby 31-15, and stayed for much of the match to scout their Sunday opponent UMF. On Sunday, with crisp blue skies and a mud-soaked pitch, UMF and ECSU faced off in the deciding match for who would be forced to travel to Colonial Coast Conference-winning Endicott College to face the talented Gulls and who would stay home to host the qualifying match. This is the first time UMF and ECSU have faced one another since the fall of 2015 when the Warriors knocked the Beavers out of the playoffs in eerily similar conditions. With family, friends and fellow UMF alumni galore, it seemed more like a home match for the Beavers. From the opening kickoff both teams utilized similar styles for the soft and muddy pitch, testing one another's defenses in an effort to draw first blood. It didn't take long before UMF Captain Jack Neary burst through a gap in the line. He was supported by eager wing newcomer Kesuma Mkare who then scored the first try of the match and his first of the year off a keen pass by Neary. Minutes later, UMF would score again, in large-part thanks to the work of the tireless forwards led by Co-captain Ian Morrison, Mack Telfer, and the tenacious Hunter Harrington. Perhaps the Man of the Weekend was UMF's scrumhalf Patrick Powers who was able to steer his fowards and dish out delicious passes to his backline throughout the soggy afternoons. By the end of a long and test-riddled weekend, the UMF men were able to secure its second straight NERFU Championship by beating the spirited ECSU men 36-13. This was despite the ECSC's men's ability to control long portions of the match on either side of halftime. UMF's double win for the NERU championship gives the Beavers the right to host perennial powerhouse and defending North East Region NSCRO champion, Salve Regina. The Ospreys knocked UMF out of last year's regional final. Both teams will have every incentive to win the match that will send one on to Sienna College in New York the following weekend. The winner of that match will represent the northeastern region in the national semifinals held in April. 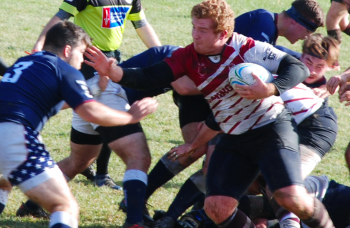 Kickoff for the men's NSCRO qualifier will be held noon on Sunday, Nov. 11 at UMF's Prescott Field. 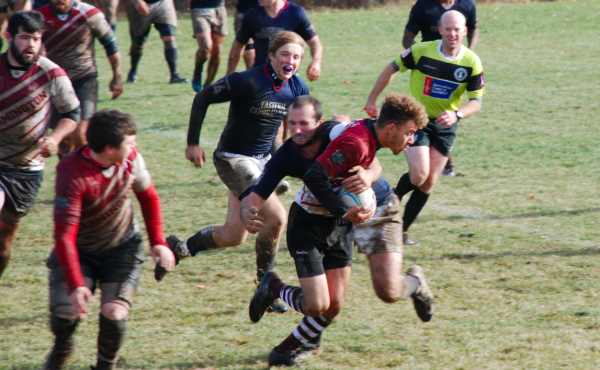 Perhaps the Man of the Weekend was UMF's scrumhalf Patrick Powers, center, here in a perfect dive pass to get the ball to stand-off Killian Miller as he is tackled. Throughout both weekend matches Powers was able to steer his fowards and dish out delicious passes like this one to his backline. UMF Captain Jack Neary sheds a ECSU player who attempted to tackle him during Sunday's match. UMF won by a score of 36-13. UMF's Shane O'Neil, at left, and Davion Jackson (ball carrier) nail a beauty of a switch pass to advance the ball down the field. UMF earned the NERFU championship and the right to continue in the play-offs towards the nationals.